Whilst some say big is beautiful, when it comes to eating out and food in general I think the opposite is usually the case and as the title suggests good things often come in small packages. Think humongeous food factories versus small local artisan producers. Give me Riverside Farmer’s Market in Cardiff over Tesco’s et al any day. 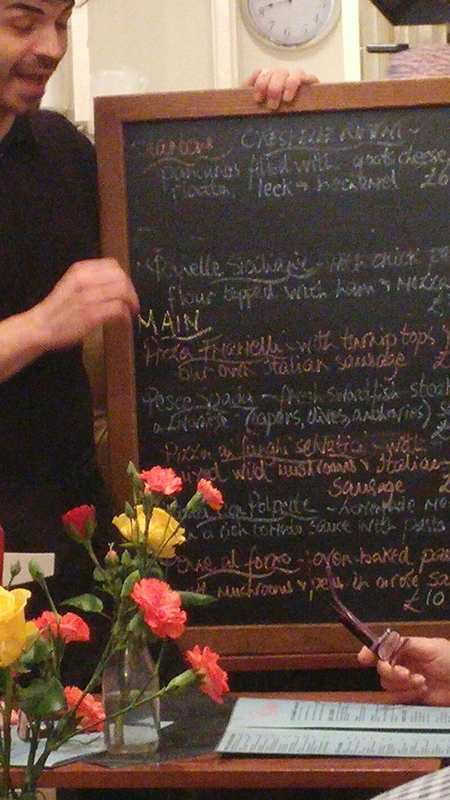 As for restaurants, I will invariably favour little and local over the chains. Not that all chains are bad and all local places are good, but a good little un inveritably beats a good big un. 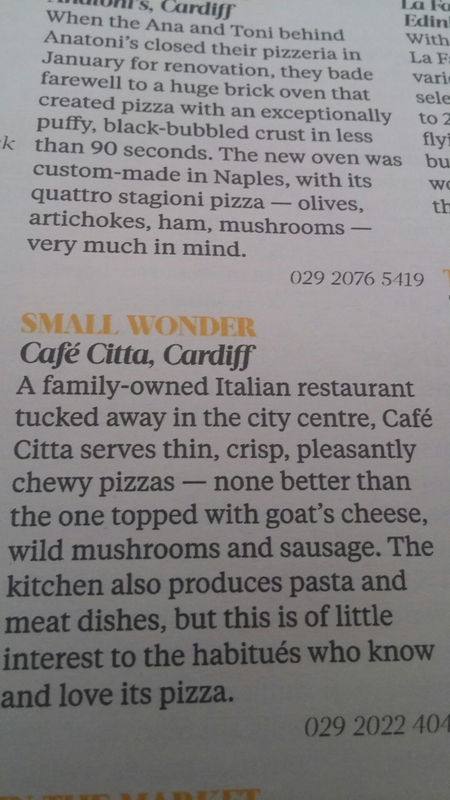 A recent thumbs up mention in the Sunday Times Dish Magazine and inclusion in the newly published Phaidon’s “Where to eat pizza” presented an opportune moment to take a look at, that perennial Cardiff favourite, Cafe Citta for the blog based on a lunch there with the usual chaps from work. 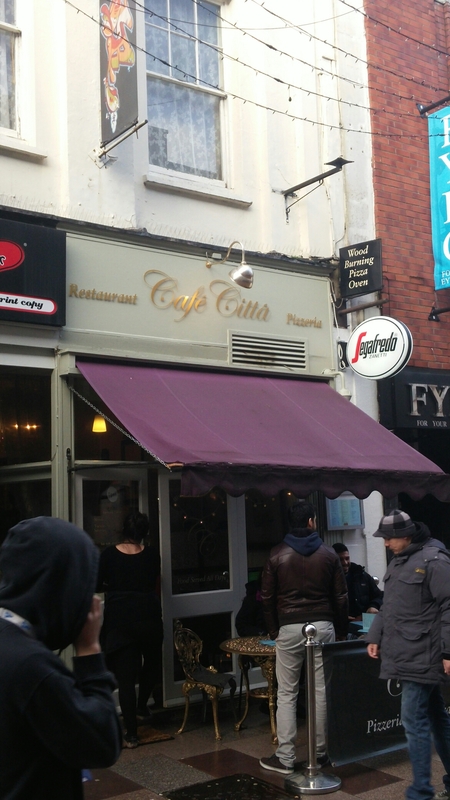 In terms of restaurants, Cafe Citta can never be regarded as big. “Not enough room to swing a cat” is the phrase that springs to mind when you enter the place. At best you could say it is compact and bijou. 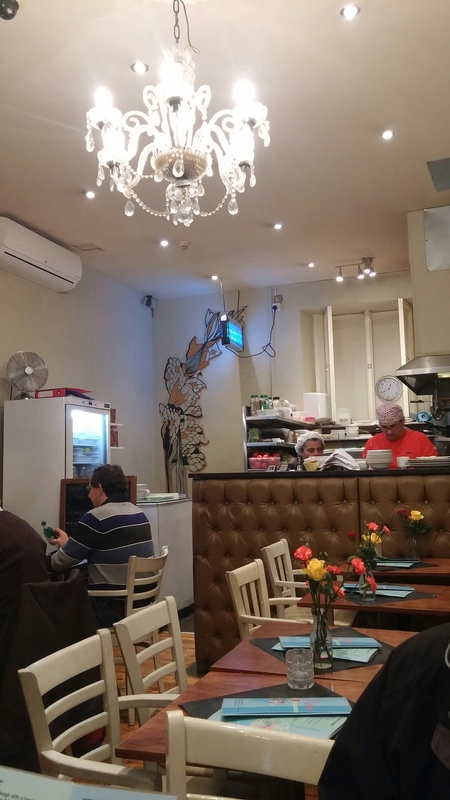 I like it, as it is cosy and you can see the chef at work in what is a ridiculously small kitchen (it would not seem out of place in a bedsit). 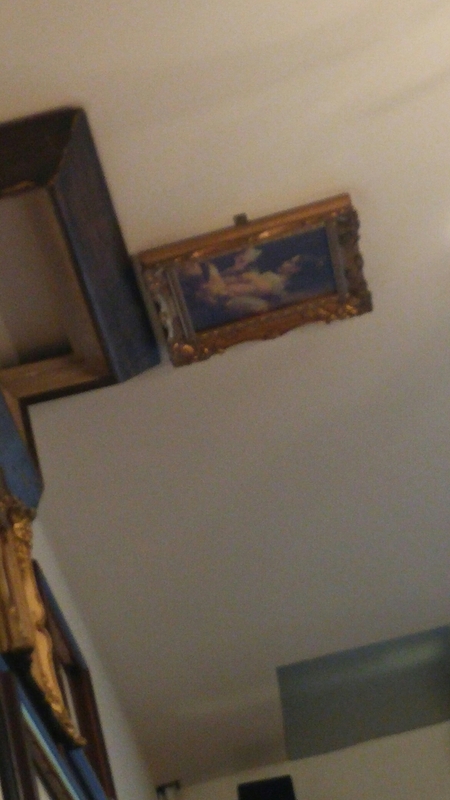 Some quirky decor in the place – framed paintings on the ceiling included. All in all a nice, if somewhat cramped, environment for a feed. You perhaps need to know your dining companions well as you will at some point, if they are to the side of you, knock elbows with them. When eating here I am in constant fear that I will inadvertantly side swipe a fully laden waiter/waitress. and pasta, with a smattering of non pasta or pizza main courses. Must say I was just a tad disappointed to see mention of cream in their carbonara dish. I am a bit of a stick in the mud traditionalist, on many things food wise, and to my mind if it has cream in it, it may be very nice but it ain’t a carbonara. A carbonara should, I believe, only have five ingredients in the form of egg yolk, Pecorino Romano (not parmesan), guanciale (not pancetta), black pepper and pasta. I can live with pancetta, in place of the guanciale, and parmesan, in place of the pecorino, but cream is a no, no for me. They is also a pretty chock a block “specials” board which will be lodged at the end of your table by the waiter (did I mention space is at a premium) before you order. As the place’s forte is pizza, I was always going to go for one of those. Love a proper wood oven baked pizza, me. 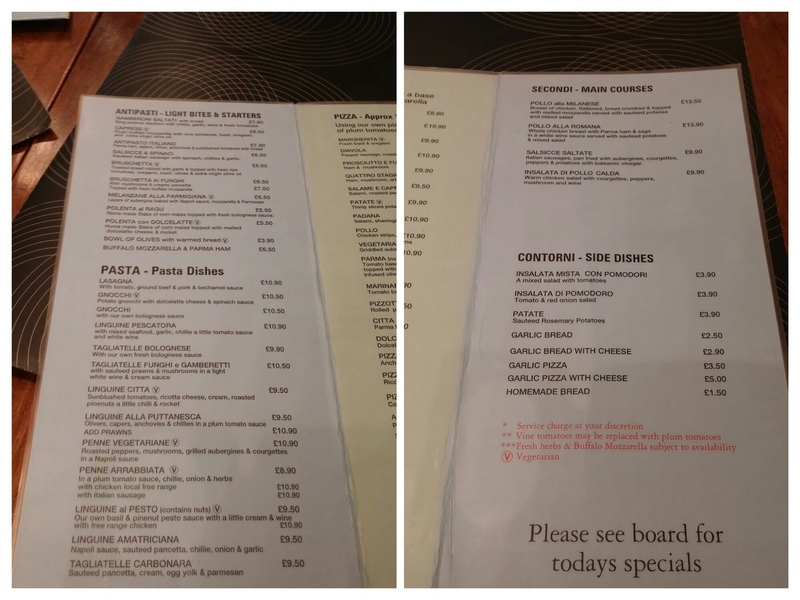 After a fair bit of indecision (lots of options), I went for a wild mushroom and Italian sausage number (£11.50) off the “specials” board (as did one of my fellow diners). 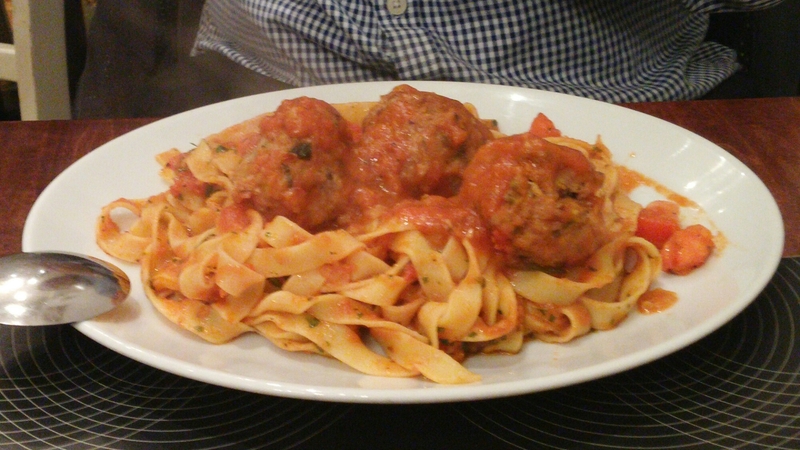 This has a decent spread of mushroom and good, fennel heavy, Italian sausage with a well flavoured tomato sauce. My only slight gripe was the mushrooms were pickled (unadvertised as such) and the pickle flavour somewhat overpowered that of the mushrooms themselves. The thin base was exemplary, with that deeply satisfying thrump when tapped. Well cooked, with a crisp exterior and a nice chew to the interior (as a good pizza base should always be). None of your deep pan bready monstrosities in this place (thank the Lord). We passed on deserts as the mains are very substantial for a lunch time meal, unless you make it your main meal of the day (I didn’t feel the need to eat in the evening). 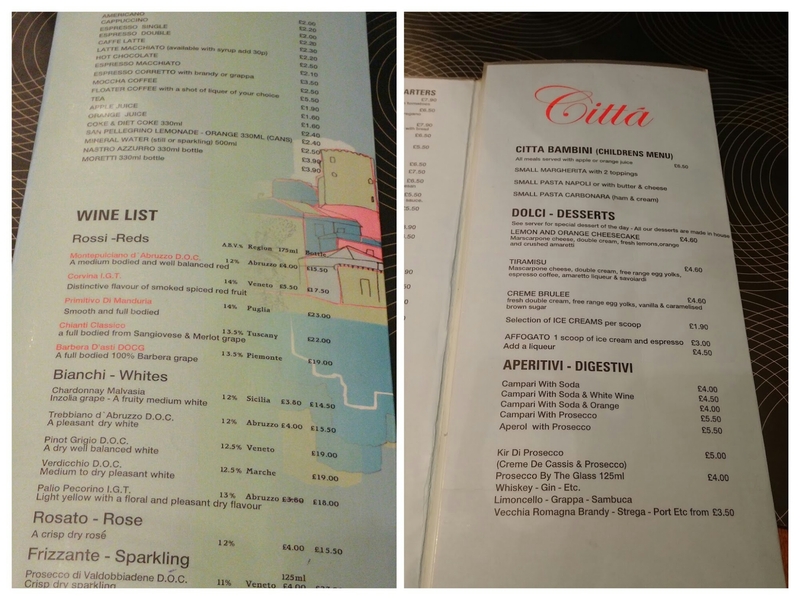 On the booze front there is a short all Italian wine list, with the usual suspects on it. These are all pretty good wines for the pizza and pasta dishes that dominate the menu and the prices look pretty reasonable. I would have liked there to be a bit more information as to producers and vintages and for the list to be a bit more adventerous in terms of exploring the plethera of wonderful native Italian white and red grapes. We were all on the non alcholics drinks and on mass opted for a San Pellegrino ( £2.40) and finished off proceedings with two very decent (you would expect nothing less from this place) single espresso coffees (£2 each) and (a choice subject to much derision – wasn’t me) a cappaccino (£2.20). I really like Cafe Citta. It is one of those ever reliable places that guarantees you a good feed. It certainly deserves its plaudits in The Sunday Times and Phaidon’s “Where to eat Pizza”. 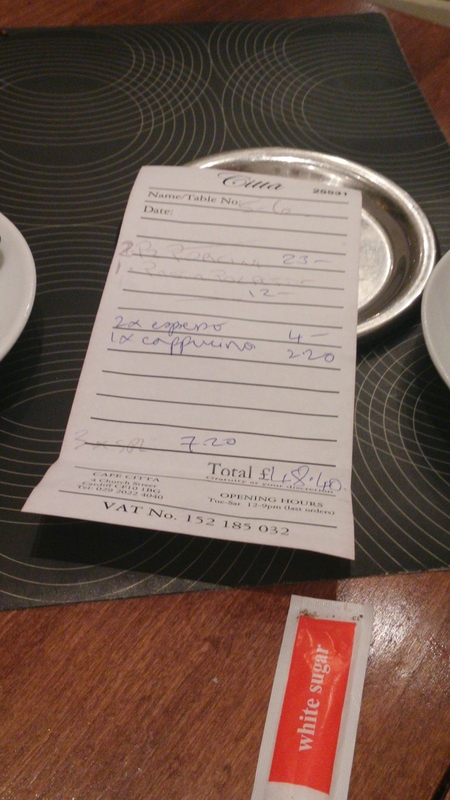 For lunch it isn’t cheap with the bill coming in at £48.50 (for 3) with soft drinks and coffee (but ex.tip), but if this is your main meal I think that is fine and portions, certainly for the pizzas, are very generous. 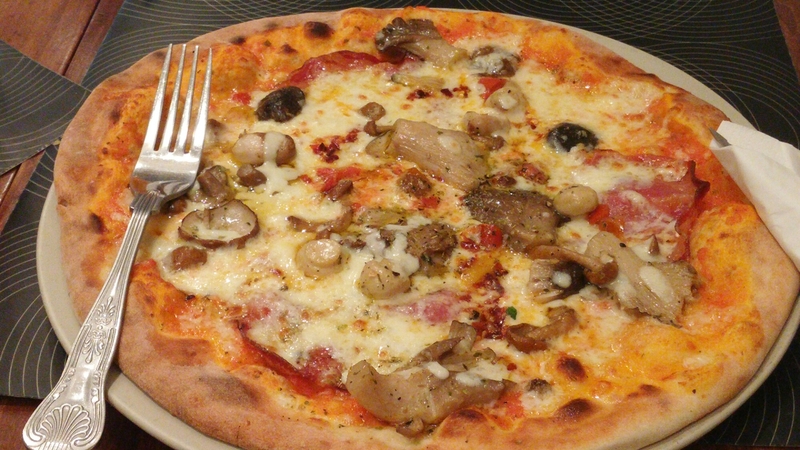 I do think The Real Italian Pizza Company gives it a run for its money on the pizza front, but Cafe Citta has a certain charm that takes some beating. Would I go back? 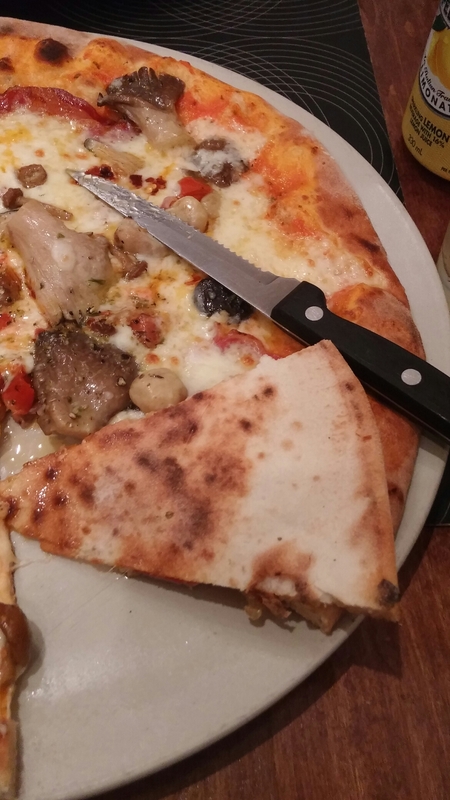 Definitely – great little place for a superior pizza. 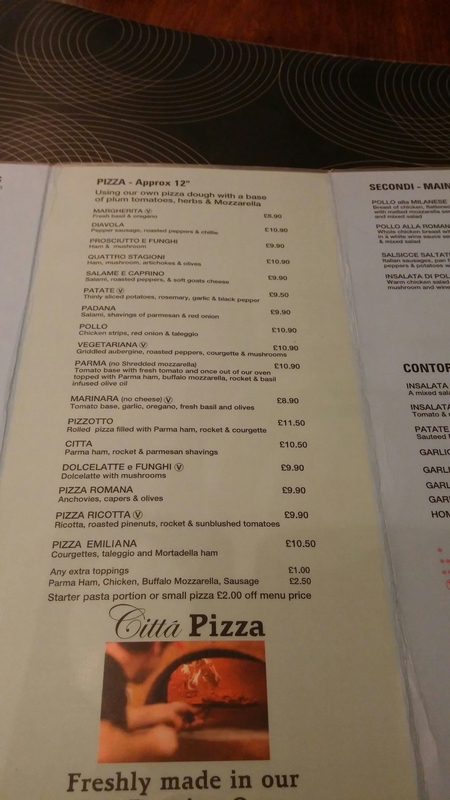 This entry was posted on Mar 13, 2016 by solicitingflavours in Alcoholic drink, Cafe Citta, Cardiff, Cardiff restaurant, charcuturie, cheese, coffee, Drink, Food, Food and wine products, italian, Italian wine, Italy, lunch, lunchtime, Non alcoholic drink, pasta, pizza, Real Italian Pizza Company, Red Wine, Restaurant Review, review, Wales, wine.